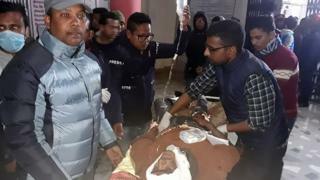 At least 23 people died in Nepal when a bus carrying students and their teachers back from a botanical trip ran off a road and plunged 700m (2,300ft) into a ravine. Another 14 people were injured in the crash in Dang district, western Nepal. Most of the victims were students aged between 16 and 20, officials said. Two teachers and the driver also died. The cause of Friday's crash appeared to be speeding, a police spokesman told AFP news agency. The students and teachers were from the Krishna Sen Ichchhuk Polytechnic in Ghorahi, Dang district, the Kathmandu Post reported. They had been returning from a visit to a farm when the bus veered off the road near Ramri village. Police said the bus had been carrying 37 people. Road accidents are common in Nepal, usually caused by bad roads, poorly maintained vehicles and reckless driving. Last week 20 people died when a lorry carrying mourners from a funeral plunged into a river in central Nepal.